Features an integrated touchpad with GlidePoint technology. 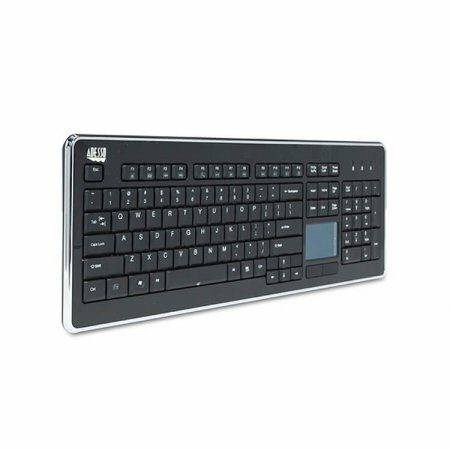 Adesso Slimtouch Keyboard Touchpad Desktop Keyboard features an integrated touchpad with GlidePoint technology. The touchpad takes the place of your mouse, making it easier to control the movement of the cursor on your personal computer. The Adesso Slimtouch Keyboard Touchpad features tactile membrane keys for quiet typing and has an elegant sleek design with metallic accents. Built-in Touchpad An integrated touchpad eliminates the need for a mouse and saves valuable desk space. The Glidepoint Touchpad puts cursor control at your fingertips and its central positioned offers ultimate comfort and convenience. 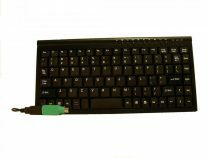 Embedded Multimedia and Internet Hotkeys Control your home entertainment functions with the built-in multimedia and Internet features on keyboard. Contemporary and Stylish Design The slim and stylish keyboard design with chrome accents and piano finish adds style in any room.